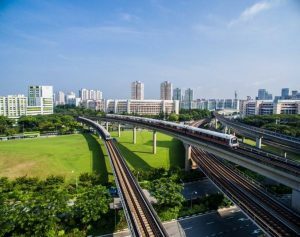 Singapore’s Land Transport Authority awarded Siemens Mobility a EUR 70 million contract for the electrification of the Circle Line Stage 6 and the North East Line extension (NELe). The contract includes delivery of the rail electrification system (direct and alternating current) as well as the overhead power lines for the NELe. The Circle Line Stage 6 is a 4-km extension section that will close the loop for the CCL by connecting HarbourFront Station to Marina Bay Station. When the three CCL6 stations are completed in 2025, the CCL will have a total of 33 stations, including 12 interchange stations with other MRT lines. The 2-km North East Line extension (NELe) serve Punggol North including the new Punggol Downtown starting 2023. “The extension of the Circle Line and the North East Line will expand the mobility options for millions of commuters in Singapore. With the electrification of the two lines, we will be making an important contribution toward decisively improving the availability of public transport in the city-state. Just last year, we won two key orders for signalling systems and digital services in Singapore,” Michael Peter, CEO of Siemens Mobility, said. Under the contract, Siemens will be supplying the Sicat SR (Siemens Catenary System Standard Rigid) aluminum overhead busbar system. Compared with conventional overhead power lines, Sicat SR has a lower installation height and has a low voltage drop. In addition, the system has a high current-carrying capacity, short-circuit resistance and reduced contact wire wear. For Siemens Mobility, this is the third contract in Singapore within one year. In March 2018, Siemens Mobility was commissioned to deliver the signalling system for the extension of the Downtown Line 3. An order to supply a Rail Enterprise Asset Management System followed in September 2018.